Tip: Use the Plumber CV Template below as an example to help you write your own personal and fully-tailored CV. I am a keen, hard-working, multi-skilled and ambitious qualified Plumber with over five years of experience in installing, repairing and servicing gas appliances and working on a variety of plumbing and heating systems. I am always willing to go the extra mile to deliver a high standard of work and exceed customer needs and expectations. Oct 2009 – Present Plumber Plumbing Solutions Ltd.
Mar 2009 – Oct 2009	 Domestic Plumber and Heating Engineer 1&2 Ltd. Repairing pipes, sinks, baths, basins, etc. Installing washing machines, dishwashers, cookers, etc. My hobbies include socialising with family and friends, playing snooker and supporting my local football team. In my spare time, I also enjoy doing small DIY projects on the side in order to improve my practical skills and abilities. 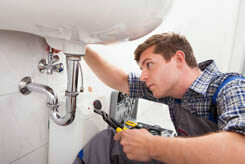 Senior Plumber, Plumbing Solutions Ltd.
A Plumber’s job is very much practical, hands-on and does not require a high-level of education in order to excel in it. For this reason, the majority of your CV should clearly focus on your previous work experience, practical skills and personal drive to succeed.